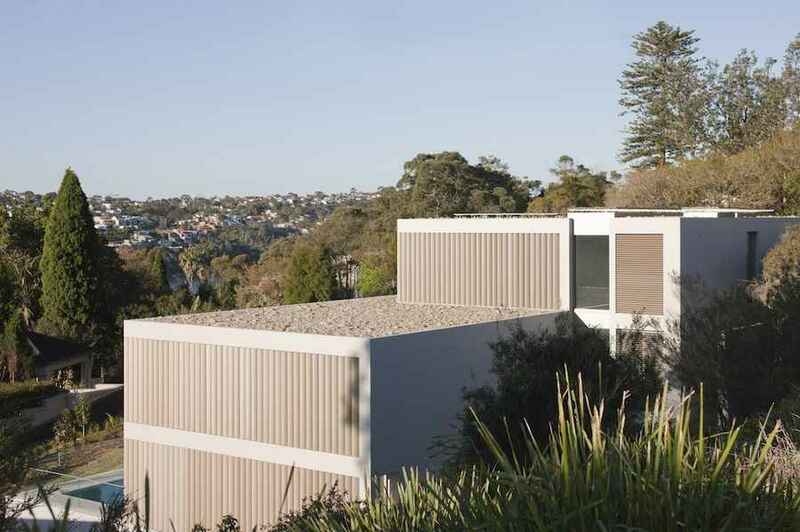 This project is located in Mosman on a north facing slope looking across Sydney’s Middle Harbour to the Spit Bridge and Clontarf. The site falls away dramatically from a broad and densely landscaped verge on the street frontage, with a high sandstone cliff forming the southern boundary. The house is nestled into this cliff, shielding it from the street, where it appears as a single storey, focusing attention on the magnificent view to the north. Entry is from the side street across a small bridge to a front door that opens to a grand stair descending the full height of the house and dividing it into two clearly differentiated volumes. The southern volume contains the service spaces, bathrooms, laundry, dressing room and a small study, while the northern volume contains the living areas and bedrooms. The glass roofed stair between these volumes has an ambiguous reading, neither inside nor out. It is only when one passes through a series of Oak framed portals that you are officially inside. The lowest level contains children’s bedrooms and a games/TV room that opens to the swimming pool terrace. An undercroft below this level contains the pool equipment and plant room. The middle level contains the main living areas, garage and a large north facing outdoor room opening off the kitchen and dining room. The upper level is given over to the main bedroom suite, home office, study and main entry. The simplicity of the external cement rendered form is enriched with an overlay of light bronze anodised aluminium windows, sliding doors and external sun control louvres, while the interior is defined by the Oak joinery and Travertine floors. The northern elevation is composed of a series of stepped cantilevered roofs and balconies with full height ellipsoid aluminium louvres screening the western facade from the afternoon sun and the neighbouring property.